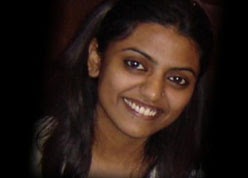 Soumya was shot dead while she was driving her car back home at around 3:40 AM in the morning. Initially this was registered as a case of road accident, but the post-mortem report revealed the fact that she had a "bullet" which was piercing her right skull. Not even in the wildest of dreams one could have imagined such a fatal end for one of the most loving human being in the Headlines Today news room. The interviews given by her colleagues were heartening and they way Avanthika Singh and Nida Khan presented it today morning was quite evident with the fact that, they felt it as their personal loss and not just a colleague to all of them. I pray for her soul to rest in peace and GOD has plucked that wonderful flower from earth and planted it in his garden, though she is not with us today, her good work and the mark she has left in the field of journalism would always remain forever with us.